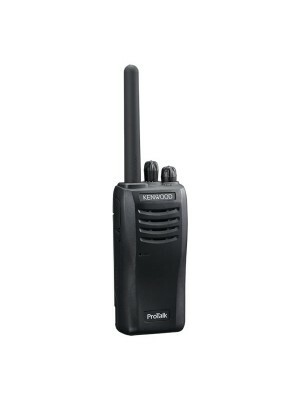 The Kenwood TK 3501 analogue Protalk 446 radio is a brand new hand-portable to replace the popular TK-3301. With newly-enhanced features it is ideal for professionals requiring a user-friendly license-free radio communications solution. This radio is ultra-lightweight, weighing just 210g with an IP rating of IP54 for water and dust-resistance as well as military standard 810 C, D, E, F & G standards. channel frequency, QT tone or DQT code with ease. Other features include a single priority scan to find available channels, built-in VOX (hands-free), and 10 calling alert tones amongst others. EACH PACK COMES COMPLETE WITH TK3501 HANDSET, KNB63 LITH-ION BATTERY, KSC35T SINGLE RAPID CHARGER AND A BELTCLIP.